Ever since cryonics was first conceived of 50 years ago, people have been waiting for scientific proof that it might actually work. Sure, scientists have been able to indefinitely cryopreserve human embryos for the past 30 years. But what about something with memories and an identity? Can memory be retained after cryopreservation? […] Our results in testing memory retention after cryopreservation show that the mechanisms that regulate the odorant imprinting (a form of long-term memory) in C. elegans have not been modified by the process of vitrification or by slow freezing. That’s amazing! Skeptics previous had room to complain that there was no scientific proof that memories or identity could survive cryonics. But that room is gone. It’s the result I expected. But it’s still fantastic to see this experiment carried out and published. Of course, not all studies check out. And when I first got my hands on the full journal article… I was a bit worried. In my experience, most studies, especially exciting studies, are some combination of: poorly designed, poorly controlled, under-powered, and subsequently mined for spurious “significant” results. But my skepticism quickly turned to delight: Experimental endpoints were well-defined prior to measurement. Animal handling was done according to well-establish review-article documented methods. Materials were specified in enough detail to allow for widespread replication. A reported sub-result in the study on the survivability advantages of the SafeSpeed fast freezing/thawing method provides valuable replication of another exciting result that would have been scientifically notable even on its own. Appendices show how robust the measurements really were. It’s as though the researchers knew the standard complaints of science journalists and actually bothered to spend the extra hour or two planning a good study. So their results went from “standard and terrible” to “utterly world-class”. I know I keep telling scientists they should design and carry out their studies correctly. But it’s still breathtaking to see it done, even once. The nematodes in this study clearly remembered what they learned prior to cryopreservation. The SafeSpeed fast freezing/thawing allowed for ~100% survivability. And the nematodes were cryopreserved for a full 2 weeks in the middle of their life. By rough analogy, this would be like cryopreserving a 35 year old human for 65 years, and then watching them be revived unharmed with all their memories and going on to live another 35 years. You know, something that would allow a human to live further into the future than anyone, ever in history. Additionally, several experts in the field who I heard back from agreed that this was a “quite well-designed and well-executed study, and the results leave little doubt that long-term memory, at least as represented by olfactory imprinting in C. elegans, survives freezing with no detectable impairment.” They also felt similarly to me in the sense that even though “it’s an expected result”, it was still “good to see it in a journal publication”. So scientists have proven that minds can be cryopreserved and successfully revived — with their memories intact. It’s been peer-reviewed and published in a good journal. And experts from the field who weren’t involved in the study agree the result looks impressive. It may have only been nematodes, but it’s still a big deal. Cryonics just went from something you could believe in based on a series of good hand-wavy arguments about how ice damage and protein cross-linking aren’t really that bad (plus it would take magic for all of your memories to be instantly erased the second your heart stops beating)… to something you can believe in because science demonstrates that it works. That’s a serious upgrade. I’m definitely pleased to see cryonics crossing over from scientific theory to scientific fact. How does this update your views on the timeline to successful revival/re-animation of current cryonics patients, or the level of technological development needed to achieve that? Well, I guess this experiment should slightly increases my (already quite high) belief that there is something there to revive in current cryonics patients. Replication of the strongly positive results for fast rewarming tech that’s discussed in this research is also perhaps a very small piece of the puzzle to eventual human revival. Of course, current human cryonics patients have several disadvantages relative to the nematodes in this study. First off, although many existing cryo patients have been cryopreserved with similar (or identical) vitrification solutions to the one used in this study, I don’t believe any have ever been frozen using the fast cooling curves discussed in this article. The fact that optimal cooling and rewarming curves aren’t even well-established is a testament to how much work needs to be done in the field. Although, my understanding is that much more is known about this than is currently published. There’s always years worth of lag between lab work and final publication. (Note that this study was actually submitted for publication in 2014. I would guess at least some of the actual lab work took place in 2013.) I mean, even the correct temperature to store patients at isn’t very well determined. Everyone agrees dry ice is too warm. Most people with detailed thoughts on the matter expect that LN2 is colder than necessary. Again, the field really has a lot to sort out. So aside from the fact that all current human cryo patients were frozen along less ideal cooling curves, and were likely less well perfused, they also have an additional stumbling block: their metabolisms weren’t functioning properly prior to their cryopreservation. So someone will have to either create nanotech to read all the data straight off these patients neurons, or create some Frankenstein-esque metabolism jump-starting tech. If you have more questions about Cryonics, you`re welcome inside our Facebook Page Group. Have a great evening. Read the paper a week ago, this is remarkable indeed. One nitpick though: s/nematoads/nematodes/g (not that I have a good idea what a nematode/toad chimera would even be like). 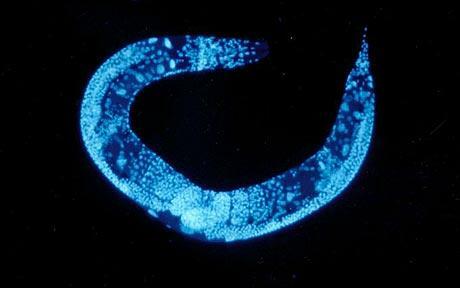 One reason off the top of my head that you can’t just proportionately scale from nematodes to humans: organisms contain radioactive elements that continuously decay and cause damage. In a living organism, this damage is continuously repaired, but in a frozen organism, this damage would continue to accumulate thru the entire period of their statis. There may be some relatively short length of statis at which you have to wake them up so they can repair themselves before the damage becomes a serious problem, even if you’re just going to put them back under. I wouldn’t get too excited about this. Recovery of small organisms like C. elegans has been demonstrated for decades now. It’s nice to prove that olfactory learning is preserved, but why would you assume that it wouldn’t be preserved by the freezing process, given that the entire C. elegans can be recovered with no obvious impairments? There really is a great deal of difference between something as small as C. elegans and larger mammalian tissues. Basically, this paper is more of a confirmation of something that was already more than likely true in C. elegans that no one before had bothered to explicitly confirm. It’s VERY far from “scientifically proving” cryonics as used on humans. Imprinting is a form of long-term memory that humans don’t do, so far as I know. The paper says they didn’t do more conventional forms of long-term memory in the experiment because the time didn’t work out — cryopreservation and revival for this worm takes 26 hours, but long-term memory other than imprinting for this worm is only known to work for 24 hours. The people who observed that long-term memory works for 24 hours probably didn’t try for 28 — perhaps they waited a day and called it good. So a reasonable next step would be to verify that the worms can do long-term memory for 28 hours, and if they can, see if that is also preserved after cryopreservation and revival.